Woody Herman (May 16, 1913 – October 29, 1987) was an American jazz clarinetist, alto and soprano saxophonist, singer, and big band leader. Leading various groups called “The Herd”, Herman was one of the most popular of the 1930s and 1940s bandleaders. His bands often played music that was experimental for its time. He was often a featured halftime performer for Super Bowl VII. As a child he worked as a singer and tap-dancer in Vaudeville, then started to play the clarinet and saxophone by age 12. Woody Herman joined the Tom Gerun band and his first recorded vocals were “Lonesome Me” and “My Heart’s at Ease”. Herman also performed with the Harry Sosnick orchestra, Gus Arnheim and Isham Jones. Isham Jones wrote many popular songs, including “It Had to Be You” and at some point was tiring of the demands of leading a band. 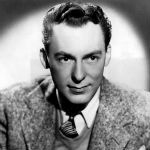 Jones wanted to live off the residuals of his songs; Woody Herman saw the chance to lead his former band, and eventually acquired the remains of the orchestra after Jones’ retirement.